PDF file format provide a great way to share documents containing text and images. While we can easily share large PDF document files in offline environment using memory cards, USB pen drives – doing same in the online world is little difficult. Do you want to share a big PDF file with online friend via email? Since email has restricted file attachment limit, sending big PDF file as an attachment is impossible. However, you can easily send big PDF file by cutting into small portions. 1. 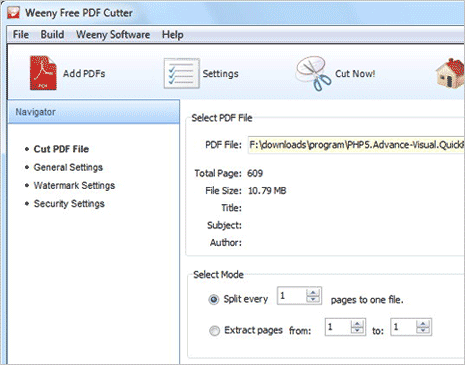 Weeny Free PDF Cutter is a free software tool to cut large PDF file into small parts. This free PDF file splitter program can cut any PDF file by pages, bookmarks or page ranges. Once you select big PDF file, you can configure file split settings by customizing number of small PDF file portions, pages to be included and so on. This fully functional PDF file splitter is completely free and has simple interface for quick usage. Also, it does not require Adobe Acrobat Reader software installed on your computer to work. 2. PDF Sam is a free open source tool for splitting PDF files. Basic version of the software is completely free and provide full functionality for splitting / combining PDF file documents for Windows, Mac users. Besides PDF file splitting, you can also use this program for other PDF routines like rotating, re-ordering, merging, mixing pages in a PDF document file. 3. 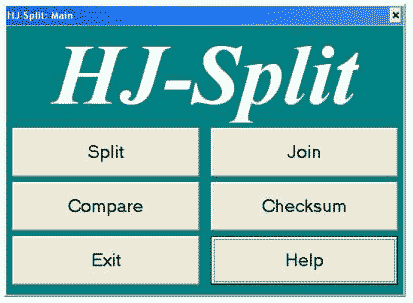 HJ-Split is a standalone file splitter software. Please note, split files are not independent PDF files. This program split big file as a file into small parts which can be further merged using small program. You can use this free software to split big file of various file formats including PDF documents. Also, this program is available for various operating system platforms like Windows, Mac, Linux. Note before you use them – If you are trying to split private confidential PDF document file, avoid using online PDF tools for privacy reasons. Also, if you intend to split very large PDF file like more than 10MB – then use offline tools (as listed above), because majority of online PDF splitters have 10MB as maximum allowed PDF file upload. 1. 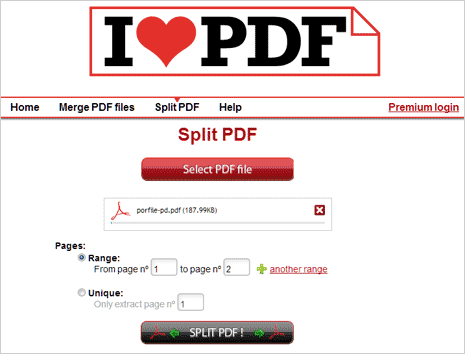 I Love PDF is a simple online PDF file splitter web application. It allows you to upload and split PDF files with maximum size of 10MB. Also, it provides paid option to upload and split PDF file more than 10MB size. 2. iPDF 2 split is an online PDF splitter tool from sciweavers. Besides the PDF file upload functionality, you can also specify online PDF file URL that should be split into smaller parts. Once source PDF file is selected, choose the splitting criterion and click Split button for final PDF file splitting. 3. 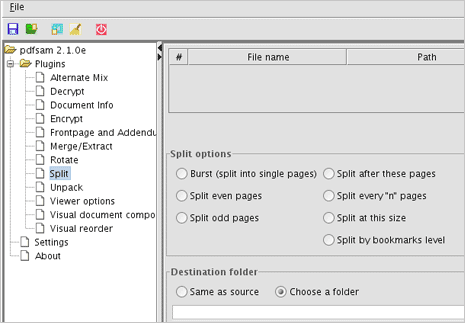 FoxyUtils Split PDF is another useful online PDF file splitter tool. It allows you to split PDF file larger than 10 MB with maximum allowed upload limit being 50MB. Online tool interface is simple, click browse to select PDF file, choose range and click Split PDF button for the splitting routine. However, you can now send attachments of inifinite size with Gmail, which makes splitting PDF useless (provided that you have Gmail). ForgetBox does the trick (forgetbox-for-gmail.com). Check it out!